Rambling Librarian :: Incidental Thoughts of a Singapore Liblogarian: The "No Bed Bugs Essential Spray"
My wife concocted a homemade essential oil spray. She did a bit of research over the Internet. To get rid of bed bugs. She says it works. I thought it made our home smell like a classy boutique hotel. I asked her what name she's calling the fragrance. "No Bed Bugs Essential Spray", she says. 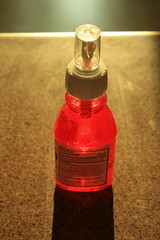 Reuse a 120ml spray bottle or perfume atomiser. Fill it up slightly more than 3 quarters full with boiled water (in lieu of distilled water). BTW, you can freely copy the above. 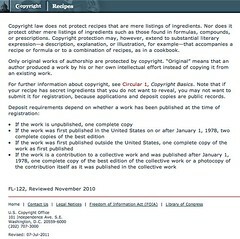 A mere listing of ingredients and procedures cannot be copyrighted. Unless the listings have "substantial literary expression-—a description, explanation, or illustration, for example-—that accompanies a recipe or formula or to a combination of recipes, as in a cookbook". Source: U.S. Copyright office (Singapore follows U.S. Copyright law pretty closely). Interesting.. Is it as potent as it looks huh.. Perhaps your wife can help all of us with another concoction that kills the dreaded flying cockroaches as well!! If it's successful, you can thus copyright these and publish all your various formulae into a book already. Big bucks for yours to keep haha..